To the visitor Cookstown has more than meets the eye. It is an interesting town with plenty of history and character that sets it apart from other towns in the region, and it is set within some wonderful countryside that you can’t fail to appreciate. The main thing that the town is famous for is that it has both the broadest and the longest street in the whole of Northern Ireland, along which you will find a good variety of shops and other businesses which range from the small family run business that has been passed down through the generations through to the major high street stores that you find in just about every town in the United Kingdom. One of the great things about coming here to explore the shops and store is the free parking that is available throughout the week, which leaves you with more to spend in the stores. Saturdays see a lot of activity in the town as this is when the large open market takes place, a market that has been happening here since the towns Royal Charter was awarded in the 17th century. There is something here for just about everybody no matter what you want from your holiday destination. With such diverse attractions as Neolithic monuments through to a modern marina there are centuries of history under your feet. There are plenty of sporting activities to be enjoyed that will let you get out into the open air to enjoy the surrounding attractions that the area offers such as golf, angling, cycling and walking. There are a number of guided tours that are available that will show you all of the highlights of the town, which are available through the town’s tourist information office. There are plenty of different venues to choose from when it comes to entertainment from traditional pubs through to performances at the Burnavon Arts and Cultural centre. Get out and about and enjoy the countryside in what has been called one of the most romantic settings in Northern Ireland. 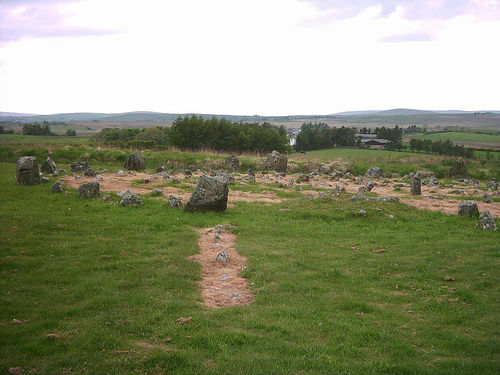 If Neolithic monuments are your thing make a point of visiting the Beaghmore Stone Circles, while they may not have some of the more impressive large monolith stones of other ancient sites, the amount of stones and number of circles certainly makes up for it. Drum Manor Forest Park also makes a good day out; take a picnic and enjoy the beautiful grounds through which there are a number of different walkways for you to follow. If you enjoy getting in touch with the history of a place then pay a visit to Tullaghoge Fort, if you time your visit well you may be able to enjoy one of the living history days that they have there. There are plenty of things that you can do as a family and lots of options for romantic moments with a loved one too, so whatever you are hoping to get from your time here you should be able to find it easily.